Guidepost is an app that accounts for the agonizing New Year’s resolution type of wishful thinking and setting goals that all of us go through. It does not take the start of a new year to stop eating, drinking, or swearing excessively, but maybe it provides us with that extra boost or a renewed energy to kick start our challenge. Along with starting with a “fresh slate” you need perseverance, planning, and intense discipline. Planning is where the use of this app comes into the picture. Guidepost boasts the ability to use “random push notifications to help improve any area of your life.” It was developed by theRiley, costs $1.99, and can be used on an iPhone, iPod Touch, and iPad. I was a little skeptical of this app to begin with, but I checked myself because why should anyone expect a miracle (a 30 pound weight loss or 180 degree attitude change) from a 2-dollar app? I have found that it does serve a specific purpose with the use of a message, timer, and push notification that can be somewhat helpful in attaining your goals. Let’s say you keep forgetting something like, to take a canteen of water to work with you, and you are forced to buy a bottle of water daily. You can set up a message, “Don’t forget the water,” and put it on a timer of Dawn (5am-8am) or Morning (9am-11am) depending on what time you leave for work and the set it for any or every day of the week and your phone will light up with that reminder. Another practical use of this app may be to remind you that True Blood starts today. 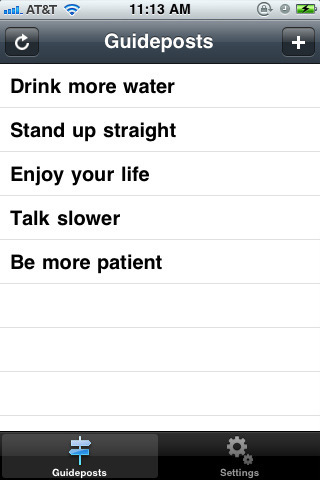 Whether you use it for long-term objectives or simple reminders, this app should come in handy frequently. I am not too sure about how this app could aid in changing destructive behavioral problems (on the iTunes page under Uses the app claims to be able to help you “become a better person”). That seems highly unlikely to me, but I have definitely been able to use the app for more practical purposes successfully. AppSafari review of Guidepost was written by Vanessa Paszterko on September 7th, 2010 and categorized under App Store, Notes, Productivity, Utilities. Page viewed 3584 times, 1 so far today. Need help on using these apps? Please read the Help Page.